The Bicycle Garden: Help me decide on a woodworking signature! Help me decide on a woodworking signature! 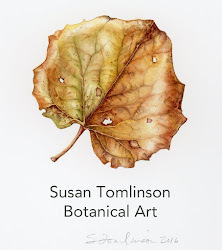 In the olden days, craftsmen would often "sign" their work with a coin set flush in the wood. The coin would bear the date of the year in which the work was made. An unembellished bronco rider? Really, Wyoming? This is all you could come up with? Very nice, in a rugged Georgia O'Keefe kind of way. ...the two states to which I claim spiritual (and actual) citizenship, having lived in one or the other for all of my life, and I got to thinking that maybe I should use one of those instead, even though they bear the wrong dates. 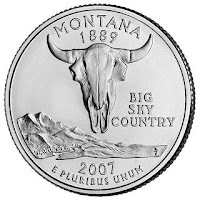 After all, the notion of laying claim to Home Ground is writ large in my life, and using a coin from one of these two states says something about me. On the plus side for signing with the proper date coin: Well, it's the proper date. On the minus side: They aren't that exciting to look at and/or I have no real connection to the states. On the plus side with going for one of my two "Home Ground" states: I am all about spiritual connection to place. 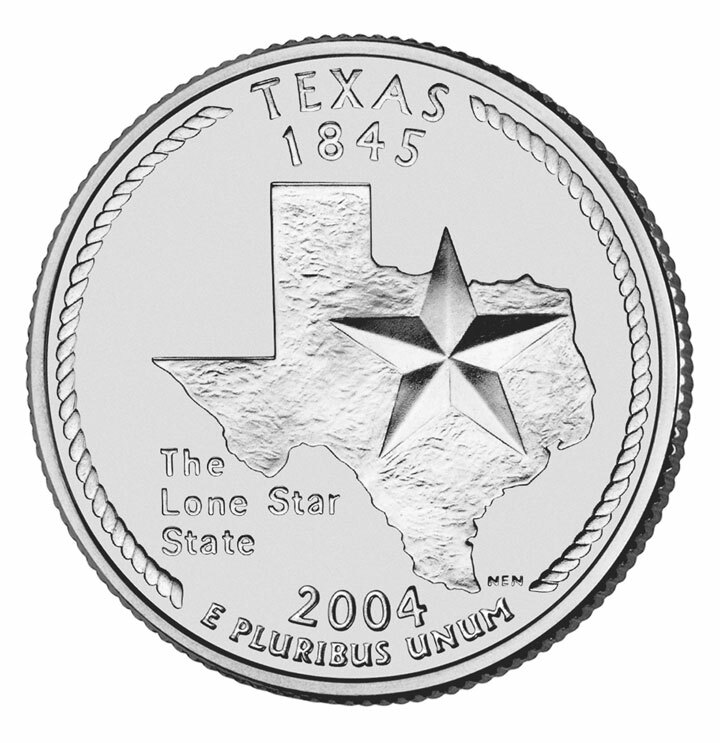 On the minus side: The New Mexico and Texas coins have the wrong date. Making a choice about this affects the direction I go with future signatures, in that whichever I go with, I should probably be consistent and use the same template from now on. 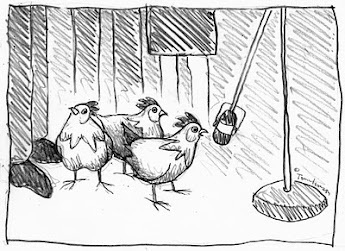 So, as you see, this is a heavy decision to make--which is why I am allowing you to weigh in on it! So help me out by going to the poll widget on the sidebar and casting your vote. I reserve the right to make the final decision, but I'd like to hear your opinions on the matter. Thanks a bunch, and cast away! 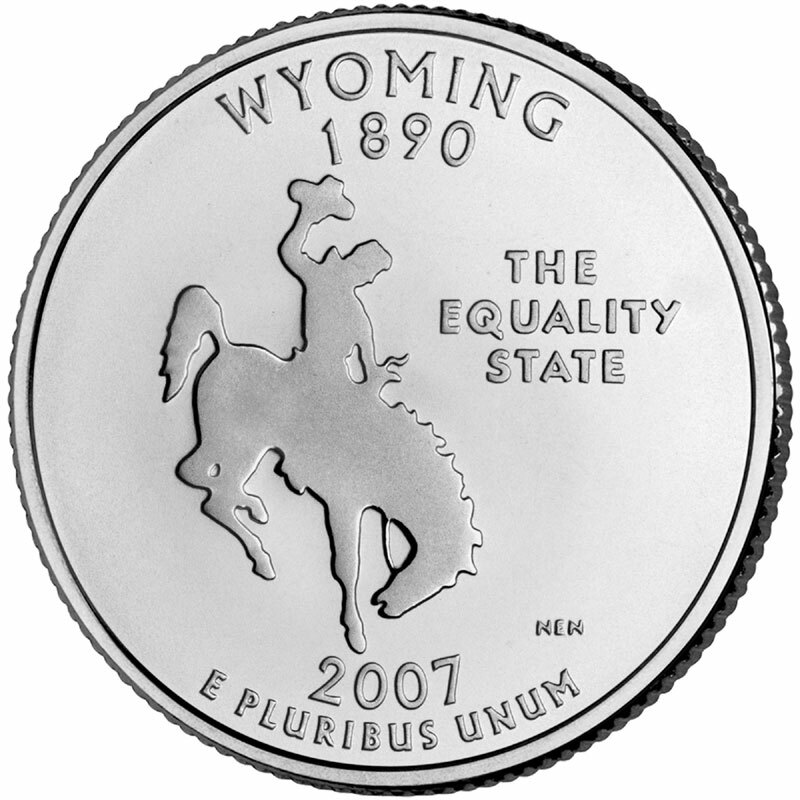 Well, Wyoming has that whole amusing hipster irony thing going for it ("The Equality State?" Really? Yes, they let women vote first, but when the most recent "equality" thing you've done is almost 100 years old, it's time to find a new slogan, no? New Jersey, I'm looking at you too. ), and I actually don't think the image is that terrible. I mean, it may not be you, but in and of itself, it's not terrible. I think, of the four, I like Montana's best. And I'm almost positive there are bleached animal skulls in Texas and New Mexico. So I'd say go with that. Are we committed to the idea of using a quarter? 'Cause there are other coins, where the date would be correct, and, unless you go with a dollar coin: hey, cheap. Dee--can't wait to meet you in Buffa10! Helen--Nope, can't do it. These are special issue quarters, minted in specific years. Hence, the dilemma. 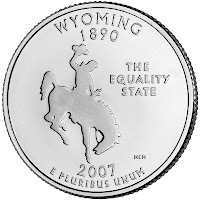 And I like clean lines, too, but I think Wyoming has simply gone too far. Heh. I LIKE Wyoming's quarter, because I think of rodeos and wild horses when I think of what very little I know of that state. But I think that you should simply go with your instincts and pick the one that first spoke to you. 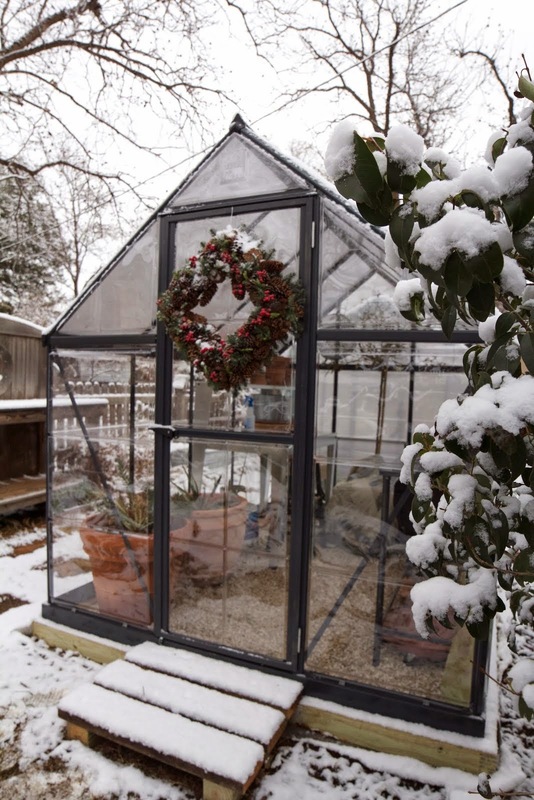 First, I have to say I think this is a really great idea. 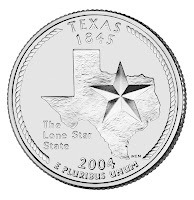 Really a shame that the TX coin wasn't minted in the correct year. Or, that you didn't build your shaving horse in the correct year :-D. Since it is the year that is important here I vote for Montana. Lastly - I need to ask a "stupid" question. Just what do you use a "shaving horse" for? 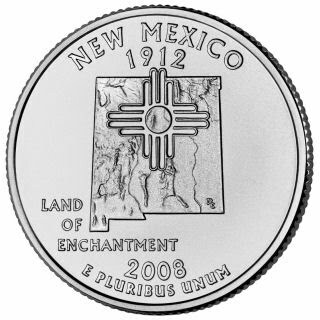 I voted for the Texas/New Mexico one, but I would personally go for the New Mexico quarter. Dates would be cool, but I think the images the quarters have stands out more than the numbers. I think you should look under the sofa cushions, there may be something there more to your liking. I like Washington. Right date, a big fish and mountains! Beg for one. I am sure someone will send you one. Lindy--Not a stupid question at all. A shaving horse is a special bench used for some kinds of carving. 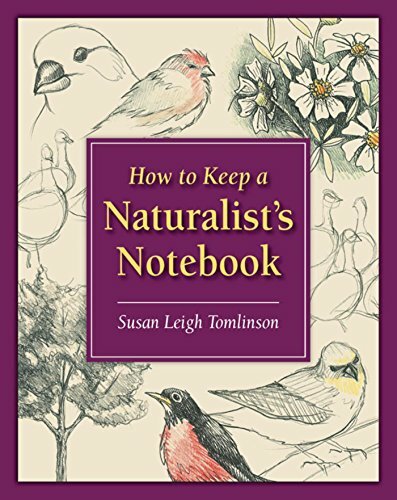 I use mine to carve canoe paddles. Laura--Hey back atcha! I'll take your vote under advisement. Carmella--I'll see if I can scrounge one up and take a look-see. 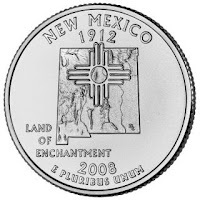 Instead of having to choose betweens tate quarters, why not use a nickel? They're all the same so no state/place favoritism and in future projects they'll look more consistent. Ten years on down the road, what is going to bring the deepest smile to your soul -- the correct date, or something that speaks the prairie woman in you? I voted for the “Home Ground”! Well, because I have such a connection to Texas and I long to be back there, I'd go with Texas. But that's my reason, not yours. Although it is kind of close to yours, i.e., the spiritual aspect of your decision. I do like the looks of the Montana one. Hope to meet you while in Buffalo. Won't be long now!